America's bitter Ryder Cup fallout shows no sign of abating with Jim Furyk hitting back at Patrick Reed's claims of "a buddy system" and the captain confirming that his side's two top-ranked players did have an "altercation" in the dramatic aftermath. 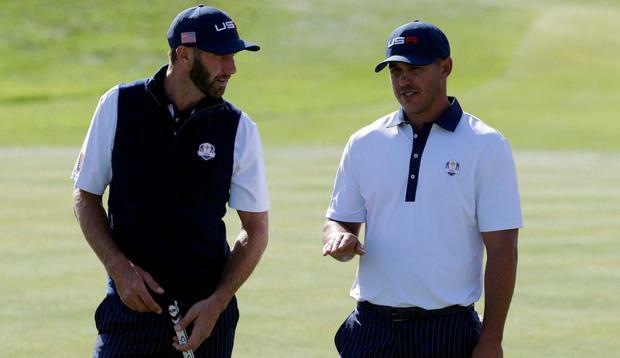 Brooks Koepka last week sought to knock down Telegraph Sport's revelation that he and world No 1 Dustin Johnson had to be separated in the Europe teamroom in the post-match celebrations. "It's not true," Koepka said. "In our four years of friendship I can't even remember raising my voice to him." But, in his first interview since the 17½-10½ defeat, Furyk admitted he had contacted both since and there was, indeed, a flare-up. Koepka and Johnson clearly tried to play down the incident to Furyk, but sources have since explained it was a heated affair. "Whatever altercation started, or what happened, it was very brief," Furyk told the Golf Channel. "They're like brothers. Brothers may argue, brothers get into it. But they're as close as they've ever been, and it really had no effect on either one of them. Furyk confessed to harbouring a "hollow" feeling after the week in Paris and that is little wonder considering the controversies which followed in the wake of the unexpected humbling. Patrick Reed – the artist once known as "Captain America"- elected to hurl Furyk under the nearest bus with his comments concerning Furyk's decision to pair the Masters champion with Tiger Woods instead of Jordan Spieth. The latter asked Furyk to play with Justin Thomas instead. "The issue's obviously with Jordan not wanting to play with me," Reed said. "When it comes right down to it, I don't care if I like the person I'm paired with or if the person likes me as long as it works and it sets up the team for success." Reed claimed to have been "blindsided" by being paired with the 14-time major-winner. Furyk dismissed Reed's declaration. "Ultimately they knew weeks in advance that we would start the Ryder Cup with Patrick and Tiger being partners," he said. "Patrick and Tiger were excited about playing with each other. The fact that they [Spieth and Thomas] played together had a lot more to do with me pairing Patrick and Tiger. If Tiger doesn't make this team and he's a vice captain, then Jordan and Patrick go out together. Just like Koepka and Johnson, Furyk has had a text conversation with Reed since, although he would not reveal the contents of the messages. Furyk is plainly determined not to allow the unseemly events of the last day at Le Golf National to ruin his memories. However, regardless of his adamant tone, that might prove a big ask in the months and years to come. "It's been tough," he said. "I was the leader of that team, and it didn't go the way we wanted, Furyk said. "It'll always bother me. But I'd take those 12 players into the fire any day, on any course - and I still would. It didn't work out the way we wanted, but I love those guys and I love what we had together in the team room. And I'd do it all over again." Furyk is on the committee that will decide the next captain who will try to win back the Cup at Whistling Straits in Wisconsin in 2020. He answered "never say never" when asked if he would be prepared to assume the role again, although he seemed fairly sure when stating that his job "is to help the next captain after everything I've learned in the last 18 months". Steve Stricker is the overwhelming favourite to be the successor.